The author of today’s post is Zoltán Tibori Szabó, an associate professor at the Babeș-Bolyai University in Cluj/Kolozsvár and a distinguished author and investigative journalist. His main interests are Transylvanian history as well as the history of the press, media law, and the Holocaust in Romania and Hungary. The article published here is an English translation of the original Hungarian that appeared in Élet és Irodalom, a political and literary weekly, on June 13 following the unveiling of the Holocaust Memorial in Cluj/Kolozsvár on May 27. Those who were present have attested that it was a dignified event that included all segments of society regardless of political view or creed. It seems that Romania is ahead of Hungary, and not just as far as economic growth is concerned. In Hungary the protest on Szabadság tér continues. The contrast between Budapest and Cluj/Kolozsvár is striking. Before World War I Kolozsvár had a population of 50,000, practically all Hungarian speaking, including 7,000 residents, or 14% of the population, who declared themselves to be of the Mosaic faith (izraelita). Throughout the 1920s the population of the city kept growing; by 1927, according to the Magyar Zsidó Lexikon, the Jewish community had grown to 14,000. As you will see from Mr. Tibori Szabó’s article, in May 1944 18,000 Hungarian citizens of Jewish origin were deported to Auschwitz, where most of them perished. We rarely have the opportunity to talk about Hungarian communities outside of Trianon Hungary. I am therefore especially pleased to be able to present this article, which describes the events that took place in Cluj/Kolozsvár in commemoration of the tragedy that occurred seventy years ago. Anna Horváth, the Hungarian Vice Mayor of Cluj/Kolozsvár was awarded the Friend of the Romanian Jewish Federation service medal by Aurel Vainer, the President of the Federation. Vainer also represents the approximately six thousand Jews of Romania in the Romanian parliament. The Vice Mayor received this award as recognition for her initiation, persistent support and implementation, together with the Hungarian members of the city council, of the first Holocaust memorial in one of the public squares of Cluj/Kolozsvár. 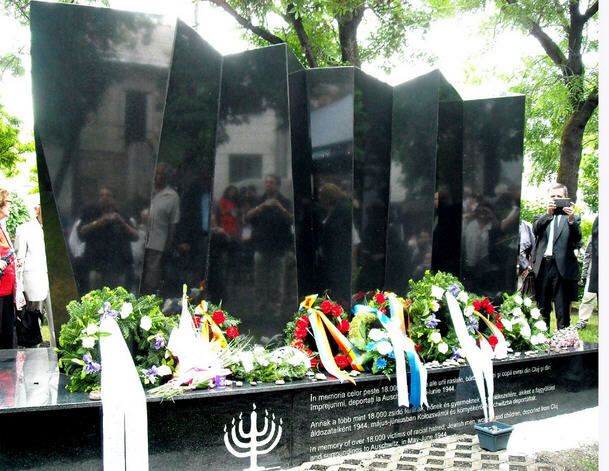 The memorial was built by the City Council, financed from public funds and it was unveiled during a dignified remembrance ceremony on May 27, exactly seventy years after eighteen-thousand Jews of Cluj/Kolozsvár were deported to Auschwitz-Birkenau, where the majority were murdered in gas chambers, their bodies were burned and their ashes were spread in the fields around the death camp or thrown into the nearby Vistula River. As a matter of fact Anna Horváth persistently represented the position formulated already a year earlier by the Democratic Union of Hungarians in Romania (RMDSZ). This position originated from facts, it forced a deep self-reflection and reached a straight forward conclusion. The conclusion was that we, Hungarians, have to face most honestly what happened, we have to openly accept our part of responsibility and irresponsibility, we have to provide reparations to the survivors, where still possible, we have to work towards reconciliation with great tact, and we also have to explain to our own children everything that happened, to prepare them for similar inhuman aggressive manifestations, that in the future possibly may target exactly us/them; so that this kind of horror should not be repeatable ever again. The facts, of course, include that the Holocaust in Northern Transylvania did not start in the spring of 1944 – as it is suggested from many places nowadays – but years before that. It started already during the fall of 1940, when, as a result of the Second Vienna Award, the Hungarian military authorities arrived to the returned Northern Transylvanian territories, and the often amazingly tactless military administration of the Hungarian motherland had begun. The first deportation started during these weeks-months, between October and December of 1940, when the Hungarian authorities collected the Jews from several localities in the Szekler counties, to transport them over the Soviet border – via Kőrösmező (today Yasinia, in Ukraine), through the Tatár-pass – to Soviet territory. This happened despite the fact that most of those deported were born in Hungary, until the Peace Treaty of Trianon (1920) they were Hungarian citizens and during the two World Wars Romanian citizens, thus based on the Vienna Award they became Hungarian citizens again. It is a sad fact also, proven by plenty of archival documents and testimonies, that deportations from the Northern Transylvanian counties continued during 1941 and 1942, mostly through the same Kőrösmező – Tatár-pass route, as earlier. And they did not end with the bloodbath at Kamenets-Podolski that took place by the end of August, 1941. Between the fall of 1940 and the winter of 1942 the Hungarian authorities sent to their death approximately five thousand Jews from the Northern Transylvanian territories, mostly based on invented pretenses but in many cases following clear socio-economical goals. Most of the victims were machine-gunned or shot in the head and buried in mass graves at Kamenets-Podolski or were executed in the ghettoes of Ukrainian Galicia or Transnistria. According to eyewitnesses, dead bodies were floating in the Dniester River for days, among them many of the Jews from Northern Transylvania. A large proportion of those dragged away during this period from Northern Transylvania were Jews from the counties of Máramaros, Szatmár and Beszterce but there was also a substantial number from the counties of Bihar, Kolozs, Maros-Torda and the Szekler counties (Csík, Háromszék, Udvarhely). This mass slaughter, that was the second chapter in the North Transylvanian Holocaust, was also designed, organized and executed by the Hungarian authorities, but the foundation for it was laid by the anti-Semitic propaganda that started in Transylvania at the beginning of the 1930s; it was completed step-by-step in the press and from the church pulpit by the Transylvanian Hungarian population, mostly based on the model from Hungary, their motherland. The third chapter in the large losses of lives among the Jewry of Northern Transylvania was caused by the drafting into labor battalions. Thousand of draft-age Jewish men were sent to the Eastern front – but without any weapons. And there the cruelties of the Hungarian army, the war itself, the famine and the quickly spreading infectious diseases ended the life of at least two thirds of the approximately fifteen thousand Transylvanian labor draftees. The fourth and final chapter of the wild anti-Jewish war in the Hungarian-ruled Northern Transylvania was the mass deportation during the spring of 1944. After the occupation of Hungary by the Germans on March 19, 1944, the government of Döme Sztójay (appointed by Governor Horthy), in cooperation with the Germans, organized and with frantic speed completed the Northern Transylvanian chapter of the “final solution”. The 1941 census counted in Northern Transylvania 151 thousand Jews and 14 thousand persons that were categorized as Jews based on the Hungarian racial laws of that era. Of these, between May and June of 1944, about 135 thousand people were gathered, pillaged, locked into ghettoes and then in three weeks they were all crowded into stock cars and deported to the death camp of Auschwitz-Birkenau. During the four phases of the murderous regime four-fifths of the Northern Transylvanian Jewry perished. The number of Northern Transylvanian victims is estimated to be between 125 and 130 thousands. Out of the eighteen thousand people deported from Cluj/Kolozsvár more than thirteen thousand died, among them about four thousand innocent children under 14. To these victims was dedicated the worthy memorial by the people of Cluj/Kolozsvár. The memorial was dreamed up by the late Hungarian Jewish sculptor Egon Márk Löwith from Cluj/Kolozsvár. His idea was implemented by Tibor Kolozsi, the well known sculptor from Cluj/Kolozsvár (who wrote himself forever into the history of Transylvanian art, by expertly restoring the group of statues representing King Matthias, the Kolozsvár-born great Hungarian Renaissance ruler, in the main square of Cluj/Kolozsvár). The memorial raised in the Postakert (today called the Caragiale Park) consists of five irregular granite prisms wedged into each other. Years ago, during a visit to Maestro Löwith’s studio he gave me a small explanation of his plan, whose concept was born during his stay at the Dachau concentration camp. The five prisms represent an important peculiarity of the Nazi concentration camps: the symbol of the five-person row of detainees. Five people, leaning all over, but grabbing each other, supporting each other, lifting each other, dragging each other, so that they remain standing. It is a symbol of the victory of life over madness and death, of the continuity of life – despite of the tragedy. I found it important to share this secret of the artist with the wide public, because many who looked at the monumentally stunning memorial in a superficial fashion, believed to see and count six blocks, assuming that it referred to the six hundred thousand Jewish victims of the Holocaust from Hungary or the six million Jewish victims from Europe. The memorial’s base has an inscription in three languages: Romanian, Hungarian, and English. The English text reads as follows: ”In memory of over 18,000 victims of racial hatred, Jewish men, women and children, deported from Cluj and surroundings to Auschwitz, in May-June 1944.” Not anti-Hungarian, not anti-German, not anti-Romanian, not anti-Russian – simply anti-racist. This is reflecting the fact that the initiative of RMDSZ was introduced to the City Council by the representatives of the Hungarians of Cluj/Kolozsvár, where the representatives of the Romanians supported it unanimously. It also expresses that the memorial was implemented through exemplary cooperation of the right wing dominated Cluj/Kolozsvár City Council and the left oriented Romanian Social Democrat–RMDSZ coalition government and it concentrates only on the victims. It does not explain, it does not interpret history, it does not falsify. Simply: it recognizes, it expresses sympathy, it mourns. It was a moving experience to see and to listen to the survivors who gathered from all over the world for the unveiling of the monument on May 27. One of them, Edit Balázs, an art historian and an academic, arrived from the North American continent. During the spring of 1944 she was dragged into the ghetto virtually from a class of the Jewish High School of Cluj/Kolozsvár and she was fifteen when she arrived to Auschwitz. She went through many ordeals and humiliations. In front of the monument she called herself lucky in her speech. To hell with such luck, I was thinking and watching the faces and gestures of those around me, I certainly was not the only one with this thought. During the morning symposium organized at the Babeş-Bolyai University, in a crowded large room, several survivors described their Calvary. In the afternoon, after the unveiling of the memorial and the Caddish said by the rabbi, some of those present were caressing the black stone blocks. “For me this is going to be my parents’ tombstone, because they were not given a tombstone” – said another survivor. Cluj/Kolozsvár thus commemorated in a series of dignified events the catastrophe that occurred seventy years ago. The scientific symposium held at the university, the moving discussions with the survivors, the reunion of the former students of the Jewish High School from all over the world, the presence of the children and grandchildren of the survivors, the mourning ceremony at the synagogue and the speeches and Transylvanian Jewish songs that followed – these just assured the frame for the unveiling under dignified circumstances, in a public square, in the Postakert, facing the old Poale Tzedek synagogue (now the Transit House, a facility of the modern culture and arts) and a whole row of houses once inhabited by Jews, of the Holocaust memorial. Thus the survivors could feel the empathy first of all of the Hungarians but also the Romanians of the city. Some placed flowers on the memorial, others placed stones. They stood in line in front of the memorial: high school students, college students and retired people; Catholic priests, Lutheran and Reformed church leaders; the Transylvanian Orthodox Archbishop; Emil Boc, former Prime Minister and the Mayor of Cluj/Kolozsvár; Hunor Kelemen, the Deputy Prime Minister of Romania and Minister of Culture; Hungarian and Romanian politicians, university professors and other intellectuals. And Anna Horváth, the Hungarian Vice Mayor of Cluj/Kolozsvár, surrounded by grateful survivors. And many simple citizens of the city. They were moved. They were overcome by emotion. They had their heads bowed. They were dignified. They felt solidarity with the victims. We wonder, knowing that this Hungarian-Jewish Community had previously receive d help from the Hungarian government, and this year, in the light of events concerning the commemorations in Hungary, the monuments., etc went along with the Hungarian Jewish Community and officially refused this assistance. Why is this not mentioned here? It is mch to their credit and if I remember, they actually refused even Before the Jewish Community in Hungary officially did so,. And then there is Hungary. The dripping, disgusting, anti-semitism of Hungarians always finds a way out. The orban regime is working overtime to gain the sympathy of the patriotic but very racist purist Hungarians. Lucky that there are exception. Civilized teachers, elected politician appear and provide decency. why is the majority remaining the prisoners of prejudices? Thank you so much for translating this incredible article and making this event known to the world. I was there as a child of two survivors Edith Neumann Weiszmann and Andrei Weiszmann and I am very moved by this article. This way my son who does not speak Hungarian or Romanian will be able to learn about the historical events and about the past of his grandparents. It was a very emotional event and was so happy to be reunited with lots of childhood friends from Cluj together with whom we mourned the ones that passed and celebrated the life. This report about the Holocaust Memorial is really moving – especially for a German like me who still doesn’t really understand how this all could have happened in Germany and Europe generally – though we know there were similar things in other parts of the “civilised world”. Thanks for that link to Hévíz – but that’s a typical “infomercial”, advertising some establishments which I would not recommend to my friends (because they are too expensive …)! We must find these teenagers, all Jews and Christians for Israel must united in a call for their immediate release. Where is our President Obama as our foreign policy has turned into a complete disaster. I have not heard one single Imam speak out against this horrible act. Today is father’s day. Imagine if your boy was kidnapped and you did not know if he was dead or alive. Video of Rabbi Dr. Bernhard Rosenberg SAYS: President Obama, You Have Some Nerve:. I was born in cluj -after the war- my parents were Eugen and Lilly Polak. We lived on Pata Utica Nr 77 and I attended the Emil Racovita school and later the music conservatorium in Cluj. We left in 1960 for Belgium and then the US. It’s mind boggling how 4,000 Jewish children were murdered ( amongst them my father’s first little daughter Erika) because the crematoriums were working “overtime” gassing the Hungarian Jews, when it got to the cluj Jews the small children were thrown in open pits by the Germans and doused with gasoline and burned alive!!!! This should stop any of you or your children as 3and 4th generations from dating and loving these cursed Hungarians or Germans or poles – the list goes on.. Looking for old friends from Cluj born in 1947/8: Jan Theil, davidovics David. Cluj is no longer out town- out parents went back after the camps and forced labor camps to see who came back- remember where our loyalty should be now. @Edith. The children, grandchildren, great grandchildren are not responsible for what their fathers, grandfathers, great grandfathers did. Btw “Sippenhaft” was another typical Nazi concept and afaik also used in other totalitarian systems. Of course I understand the reluctance of Jewish people to go to Germany or Hungary (or even talk to a German …) though I’ve had many an interesting conversation with Jews I met in London eg or in the USA. I just remember how I had to stay for a weekend in a hotel in White Plains, NY because even IBM couldn’t get me a room in NYC – there was some parade and everything was full. I met some young Jews whose family had a big celebration in the hotel (a Bar Mitzvah if I remember correctly) and we talked about all kinds of things (really interesting conversations we had – at first they thought I was from Scandinavia …) – they said that their parents wouldn’t even dream of revisiting their homeland Germany but they were interested in doing that. I’ve also written already about a neighbouring village populated mainly by Jews whose children went to school with my mother – almost the whole village left in 1938 for Palestine, many years later some of the old people and many younger ones came back for a visit. I understand it takes a lot of willpower to do that so I find it really good that some of the people now returned to Klausenburg/Cluj! They are, and their descendants are 100% guilty!!! When the 6 millions will rise and tell Eva and the children of the Nazis “:it was not that painful to be burned alive, it felt good to trample on our babies and children gasping for air, oh yes, starving wasn’t that bad, and we forgive the Nazis, and their descendants”, the Hungarian arrow cross bastards, their children – one of the most anti Semitic people ever made on this earth ( Hungarians ), then I will make a different conclusion. Until he was around, no buses blew up in Israel – no kids were stolen. IBM, BMW, AIG, KRUPP, just some of the slave labor holding German companies using Jewish victims as workers- any Jew driving their car is a show off loser. @Edith Polak@ Fact is: “Rabbi” Kahanes movement is outlawed in Israel. I heard your “rabbi” in Jerusalem. He was a cheat and a liar. Ms. Pollak should have participated at the symposium that took place in Cluj/Kolozsvar. The survivors who spoke in one of the sessions concentrated on the human goodness that existed even during those very dark days and years. I agree wit Eva that children cannot be made responsible for their parents sins. Also, all people cannot be made responsible for a minority (or majority) of their fellow citizens’ sins. I was born after the war, so I cannot judge based on personal experience what happened in Germany, how the Nazis came to power and how they stayed in power for such a long time. But I did live under Ceausescu’s dictatorship and I did see the fear. Masses of people were on the street screaming praise to the dictator. I myself had to participate in such shameful acts, because I knew, each row of marchers had one agent who was watching and reporting on who was not screaming. The punishment was not concentration camp, just fewer opportunities in life. But it worked for a long time. Also, let’s not forget that the first inhabitants of concentration camps in Germany were the political opponents of the Nazis. My mother went to Auschwitz. She lost both of her parents there. She participated in a death march that started with thousands and ended with hundreds. After she returned, for many years she was physically sick when she heard someone speaking the German language. Al she could her was: Los! Los! But this dis not stop her from making me learn the German language, from sending me to a German family in Transylvania during my summer school breaks to get me immersed into the language.. She did this because she considered the German language not the language of the Nazis but the language of Beethoven. Thank you, gdfxx, for your kind words! I liked especially your last sentence – for me also Russian is not the language of Stalin (or Putin …) but of Tschaikowski, Tolstoi and the Strugatzki brothers (I’m a science fiction fan …)! Could be true, provided the children, grandchildren, great grandchildren have truly acknowledged their ancestors’ evil and cleaned their soul from the plague that infected their forebears. Germans may be the only people that went through this process in Europe, but the hideous heads of the Hydra are rising again across Europe, including in Germany. The reactionary, racist ideologies of ‘collective guilt’ (and with them ‘collective punishment’) are still alive and well, I see. After all, capitalism couldn’t really survive without the underpinning of racism and national chauvinism (divide et impera). Your logic completely fails me. Are you saying that if your ancestors were not anti-semites than for sure you would not going to be anti-semite? It is unfortunate but you cannot detect by a simple tree of ancestry who will became good or bad. How much German you have to be to be qualified German? Edith, you are falling into the same trap that Hitler set for the Jews. He judged the Jews by their heritage, not by their individual deeds. You are not different from those who you despise if you accept their logic. After all, Stalinism couldn’t really exist without the underpinning of racism and national chauvinism (divide et impera). (like those of Hungarians) than the similar–if not same–situation will arise. So let me say it again: It is a sin of the descendants, and no less than those of their parents and grandparents, if they don’t acknowledge what had been done; and see it as a wretched wrong. But German society has passed laws and educated its people–something Hungarians have yet to do. I am quite certain if that motorcycle group would show up in Berlin carrying their “Give Gaz” signs, they’d be beaten to a pulp…and not by the police but by the citizenry. Now, how far is Hungarian society from that…? Another point: many jews happily go to Berlin nowadays–Kertesz Imre is a good example. Petofi, your sweeping judgments are wrong. Many Jews are visiting Hungary, especially many Israeli Jews. And many Israelis study in Hungary. Let’s see how long this is the case. I’m willing to gamble that, in the coming year, there will be a steep decline in both jewish visitors and jewish students to this god-forsaken place. I had to say a prayer after I’ve read the above comments and asked God to protect my mind and soul! So much hatred towards the Hungarian people! So much anger and bitterness! For the memory of the Holocaust victims, I decided to go and see the local Rabi and bring his attention to this blog and I will beg him to do something. How can one not hate a country whose citizens blithely accept the designation, “Christian Hungary”? I deal in broad strokes….like Japanese painting. Why attack a generalization that’s probably 80% right? Thank you both Laurent and Petofi, for being honest and to the point!! My hatred towards the Nyillas, budos magyarok, is only matched by my hatred towards the Germans (perfect Germs as in bacteria for short)!!! My fathers’s accounting of the Jewish men and young boys taken as slave laborers to build the Ferihegy airport, where thousands of beautiful Jewish boys were killed, his remembering his ever lasting daily hunger, humiliation by the Magyars, his return to Cluj, where he was tormented with:” how come you came back, and now want your family home back” my hatred for them is beyond words! And let’s remember right here and now -over 22,000 little boys mostly thrown in a mater of a few freezing January nights into the Buda river by willing Hungarians to drown!!! If some stupid ignorant Israelis or stupid Hungaian Jews find a good time sipping coffee next to these blood soaked bridges in Budapest let them all choke on their coffees there!!! Europe has not changed! They all took a few years nap, and now are strong to hate Israel and the Jews more than ever. I feel sorry for you. Only your hate is larger than the feeling of your loss. It must be very hard to live with so much torment. Why would you bother even to post on a blog that actually tries to teach tolerance and understanding, it is beyond me. We do not deny the awful doings of some Hungarians and some Germans. If you bother to read the blog, many of us fight against those who try to belittle Hungary’s responsibility in wwii. My father lost his grandma, uncle, aunt, and so forth because of the terror. He was taken to the tatterzal, then released. He judges people today for what they do, and not for what their forefathers did. You are ignoring posts that does not support your hatred towards the innocent. I would think you need to seek professional help. Germans and Hungarians is beyond description–your minimalization of a person’s pain just means you don’t understand. at any point in history. Save your political correctness for others: those of us who witnessed the horrors, or took the trouble to read about them, will never forget or forgive. It is inhuman to forgive such things. @ Some 1 @ I was invited to speak to the pupils of the Austrian School in Budapest and told the kids, that those who hate, damage themselves. And that nobody should be proud, because he/she was borne as a…. I would have no problem with a Christian Hungary. But Hungary is not Christian. It is – with few exceptions – a pagan country,. many Hungarians came out of the belly of a Turul, At least this is what the head of the maffia family told them. Half-Asians. Unfortunately most Hungarians have no idea what Christianity is about. and believe Christian = Non-Jewish. They do not know, that Christianity was for some hundred years a Jewish sect. Several school classes will participate – they’ve discussed this in their history lessons. A staggering statement: doesn’t the appellation immediately demean all non-Christians to second class status? I think it does. For the infinitely insecure Hungarians, that must be a point of comfort. But I would rile against a “Jewish Hungary” just as much. No country in the supposedly enlightened 21st century should designate itself by a religion. @Edith. I would like to warn you. On this blog I have never tolerated any hate speech. Rabid anti-Semites have been systematically removed. I will do the same with you if you write one more comments like your latest. My father had the foresight to leave cluj behind during communism. We left with 20 pounds each, leaving behind a 9 family brick house (his parent’s house, they were murdered in Auschwitz) our legacy in Cluj, our German shepherd, his metallurgic business in Piata Mihai Viteazu, so that we could lead a Jewish life abroad. A few months ago, as the only niece to my Hungarian aunt, who passed away, the widow of my uncle, I made sure after searching for a Hungarian Reformatus pap, and cemetary in Philadelphia, that I buried her with dignity, her Christian way… But, I refused to bury her next to a Jew in a Jewish cemetary. I have tolerance, am open minded, am my community’s leader, have traveled to cluj a few times ( trying to get back my paternal house, and they are asking me right now for death certificates for my grandparents!!! ), it shows you all how cynical they are still, and always will be. I will entertain meeting one day for a conference with some of you, in the meantime, I repeat: we have Israel now, make the move, go to a country (the USA, Canada) where you will be welcomed and can flourish- Europe is not for the Jewish children anymore. Lay off if me! THANKS. I would like to consider the same warning for Petofi. His hate toward anyone who does not hate Hungarians in general but the Jewish Hungarians is staggering. He continually attacks anyone who does not share his hate toward gypsies, Hungarians, and so forth. He not only get into battle with the Fidesz shills but with other Jewish Hungarians or others simply because they do not agree with his venomous ideas. @Some. Yes, it applies to everybody. Now, dear fellow Canadian, you can’t have it both ways (unless you’re a Hungarian!). is pretty Magyar of you! take exception to people who defend the ‘honour’ of Hungarians. Presently, no such thing exists. What, pray tell, Some1, from your cushy seat in Canada…what exactly can you find to honour in this Hungary, and these Hungarians???? And while the Truth hurts, it’s certainly must be preferable to being an apologist for a country and a people badly in need of self-examination and correction, should it not? @petofi, this all might be true but you cannot paint all Hungarians with the same brush. In fact a very interesting poll came out lately which shows that the majority of the adult Hungarians think that what goes on with the erection of that monument is falsification of history. Even among Fidesz voters only 50% think that the monument is OK. I will try to find the results broken down by party preference. Repeat, half of the population thinks that what Orbán is doing with the Holocaust is falsification of history. Fidesz 50% approves, 28% does not, 22% doesn’t know; MSZP 57% against it 27% approves; Jobbik 45% approves 39% does not; Egyutt14 61% against 29 approves; DK 79% against, 8 percent approves, LMP 64% against 21 approves. and a myriad of other topics on which we hear nothing but deafening silence…? petofi, please could you give some details on the priest who has spoken out agianst the issues you mention? I want to praise Germany. Their transformation was a miracle. I have participated in a few carnival parties in the historical Rottenburg. The German life was so wonderful, as compared to the suffocation in Budapest. @petofi Although I appreciate your special attention given to me, and I do fully appreciate your commitment to all jewish Hungarian issues, I find your personal attacks on me and others who also support the same cause but not with the same vehemence as you do unbearable. As many of the Fidesz ships and trolls you cannot be convinced at any shape and form of you being wrong, so I stopped reading your posts addressed to me after June 23, 2014 at 2:08 am.This does not mean I will not read your posts as many of them have very valid points, but I will not read your posts directed at me. Regards.